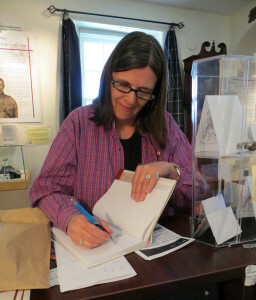 Susan Raby-Dunne is the author of several books including John McCrae – Beyond Flanders Fields ©2016, Morrison – The Long-Lost Memoir of Canada’s Artillery Command in the Great War©2017, Hell Burned Through – David Mould, The Art and Story of a Lancaster Rear Gunner©2017, and Bonfire – The Chestnut Gentleman ©2012, the mostly true story of Lieutenant Colonel John McCrae (writer of In Flanders Fields) and his horse, Bonfire during WWI. Her second book, Hope in the Colour of Orange: Dutch Civilian Memories of War and Liberation©2011, was a collaboration by her writers group, MMWG (Monday Morning Writers Group). Susan started MMWG, a diverse group of writers who met every Monday in Black Diamond, Alberta area for 10 years. Susan was born and raised in Calgary, but moved to a farm near Black Diamond in 1997 where she raised her son and bred horses. Over decades she had dabbled in various kinds of writing; publishing crime features for a major Canadian newspaper, motorcycle travel and safety articles, short stories. She currently lives in Longview, Alberta. In 2006, Susan was seized by an interest in Canadaʼs famous soldier/physician/poet John McCrae, and the events behind his indelible war poem, In Flanders Fields. This began over 10 years of research leading to the creation of the book, Bonfire – The Chestnut Gentleman and other books since. This, in turn, led Susan into a passion, not only for our military history, but also for educating the public about our soldiers and veterans. Susan is presently the Canadian representative of Soldierʼs Heart, an organization dedicated to healing soldiers and veterans of war trauma. With that organization and its leaders, Ed Tick and Kate Dahlstedt, Susan has gone to Viet Nam with veterans returning for the first time since the war for reconciliation and healing. She has also taken a WWII veteran back to Belgium and France for the first time since 1944. Both transformative and healing journeys. 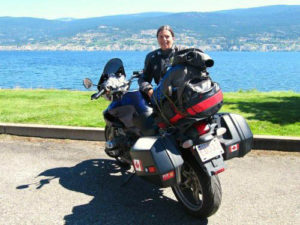 Through all this Susan is a former motorcycle safety instructor and long-time motorcycle enthusiast having racked up thousands of city and highway miles in Canada, the U.S. and Europe. “I do my best writing when Iʼm riding, or driving,” she says, in her head of course! Susan is a WWI and WWII battlefield tour guide of France, Belgium and the Netherlands with her company Canadian War History Tours. Contact: cdnhistorytours@gmail.com. Contact Susan at bonfire@xplornet.com for book or speaking details.